Children are actually quite susceptible to ingrown toenails, which can be attributed to their growing feet. Because children’s feet grow so rapidly, shoes can become tight pretty quickly. When shoes are tight, your child’s toes are crowded in the front, which presents the opportunity and increased risk that this common toenail problem will develop. In addition to tight footwear, another source of ingrown nails stems from toenail trimming practices. If you clip your child’s nails too short, or round them off, it increases the risk of the nails becoming ingrown. Provide them with shoes that fit well. You would quickly amass a small fortune if you had a dollar for every foot problem—including ingrown toenails—stemming from footwear that is either too small or too large. As noted earlier, the problem with small footwear is that it squashes the toes together in the front, which can then lead to nails growing into the flesh surrounding them. Always make sure your children are wearing shoes with plenty of room in the front. If they cannot wiggle their toes, pick another pair! Trim their toenails correctly. 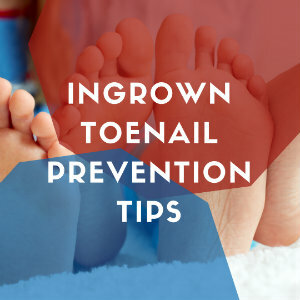 Too many cases of ingrown toenails are caused by improper nail trimming practices, but you can avoid this by always clipping your child’s nails straight across (instead of rounded) and not too short (keep them roughly even with the edge of their toes). Of course, there are ingrown toenail conditions that develop simply on account of an inherited nail structure. In these cases, there isn’t much you can do to prevent an ingrown nail, except for possibly staying on top of their nail maintenance and making sure all toenails are trimmed to the appropriate length on a frequent basis. If you have any questions about ingrown toenail care for children, or your son or daughter is in need of professional care, contact Richardson Podiatry Center today. Our Richardson, TX foot doctor office provides services to treat all different kinds of foot and ankle issues for our patients, so give us a call at (855) 919-4548 or schedule your appointment with us online right now.